Edge Hotel is the place to be on Clearwater Beach! We stayed here for a weekend getaway and also out of curiosity since it is a brand new property. We were not disappointed! The property itself is breath taking. From the roof top bar you can see water from all sides!! What made it even better was the service, everyone we met was so friendly. We will definitely be back! Room tip: Don't forget to check out the infinity pool! We just happened upon the Edge Hotel and seriously its my favorite hotel in Florida! Brand new, just opened hotel right on the water...what could be better? We sat out by the pools, yes plural, and watched the sunset. The food was incredible! We will be coming back! Room tip: Every room has a view of the gulf! Brand new hotel and I was one of the first handful of people who stayed there. Spacious room with a breathtaking view of the Sand Key Channel and Gulf. All of the staff I bumped into were helpful and friendly, from the front desk to bartenders. The roof top bar, Jimmy's on the Edge had views of the main island and the gulf. I'm coming back. Room tip: get a room on the water side of the hotel. Have lunch on the outdoor area of the restaurant. Killer view of the gulf. We attended a meeting and found this new hotel to be exceptionally well thought out. The meeting rooms and lobby were quite beautiful. 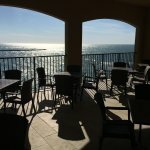 The views, food & service experienced at the tenth floor restaurant & bar were some of the best we've encountered on Clearwater Beach. Do yourself a favor and check it out ! !